We motored the whopping mile to Lake Sylvia and who was there? 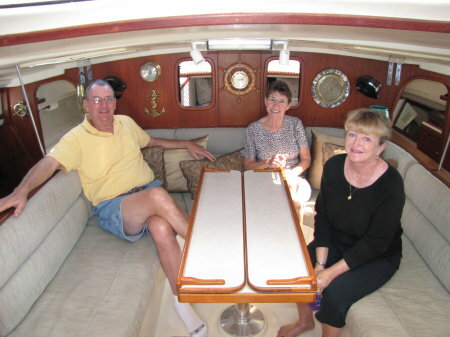 Rick, Linda, and Kirby the wonder dog aboard Make It So. You might remember we hung out with them about 2 years ago. They have a 420 Lagoon which "was" electric drive. Unfortunately, they had many problems and it is now converted to diesels. 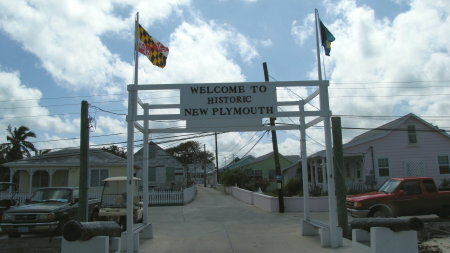 We got to see them before they left and look forward to see them again in Baltimore. Later in the day we saw this guy below run aground. All the books say hug the shore to the east. Well, he was west. Boat US enjoyed helping him off along with collecting the appropriate fee for the fact he didn't buy a book. By the unlimited insurance from Boat US and buy books. That is part of the advice I can give. 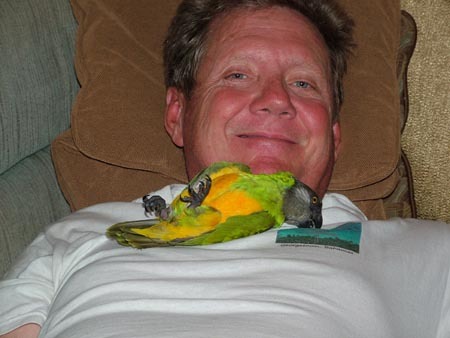 We hung out with the rain moving in and Jimmy Buffett enjoyed hanging out on the couch. 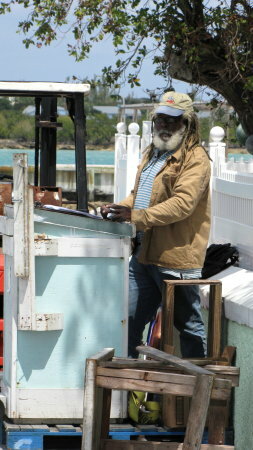 In the picture he was biting the image of our boat in Georgetown which was in the Exumas. Then on Saturday morning before we got going for our lunch and trip to West Marine, Sailorman, and Bluewater Books, Fred and I both got boarded by the Florida Water Commission. They were checking heads to ensure we were all locked up and not dumping overboard. We were both fine and they did a very professional job checking. When we headed in, down the canals, for lunch I took a bunch of pictures that you see below. 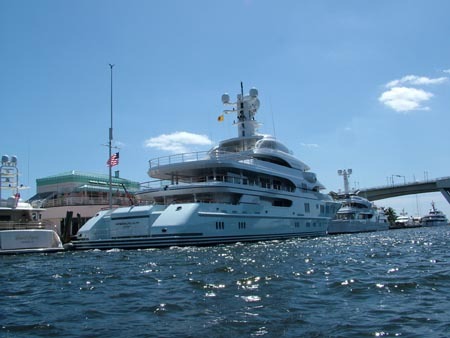 They kind of make our Yacht make small compared to these but then again, who say's their quality of life is better? Right!!!! A good rationalization is just what I need right now. Can anyone give me a good stock pick that will allow me to invest a thousand bucks and walk away a multi-millionaire next week? After a great shopping trip to the largest West Marine store in existence plus the rest of the stores we met back up with Deb who had done here own shopping. Then we rode the dinghy back hoping the boats were where we left them. When we arrived back we saw this wonderful example of a Gemini 3000. 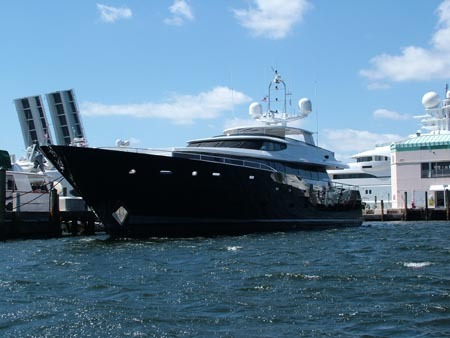 For those who read my site you know this is one of my favorite Gemini's because it has a larger clearance beneath the hull where the table sets and where the large seas at anchor hit and explode. Of course that is the one thing I admire about the 3000 BUT I really love the 105 for the rest of the things. So we won't be changing soon. 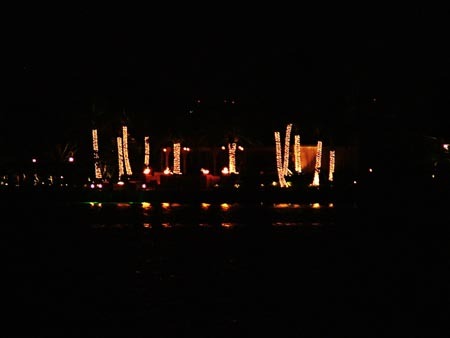 We were watching outside our boat when all of a sudden the flames came up from the torches at this home to the left. We never saw a light come on in the house so we can only suspect that these were automated. Ahh, the carbon imprint people leave. Do I sound Green? I'm really not but I also don't believe in waste. I'm not preaching because if I had a flame system around a fireplace outside I think that would be really cool as long as I could afford it. Like I said before - a stock pick or perhaps the powerball numbers. We left Sunday morning from the anchorage right after the sun came up. We did remember to set our clocks forward and we picked up a few gallons of diesel just in case along with gas for our generator. 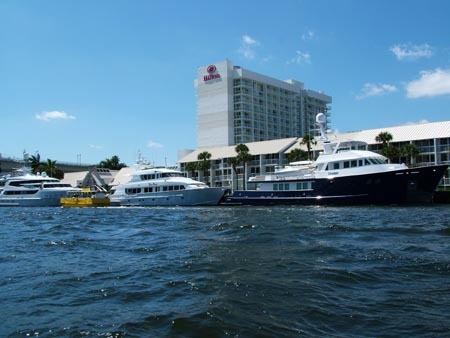 Ft. Lauderdale is a big port and it shows. 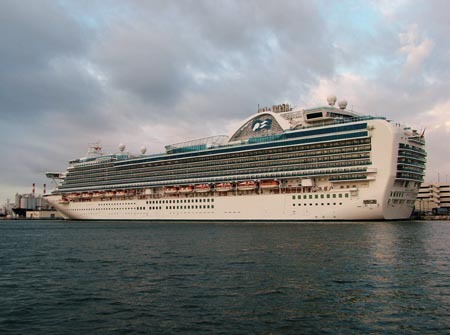 There were seven cruise boats in when we left. 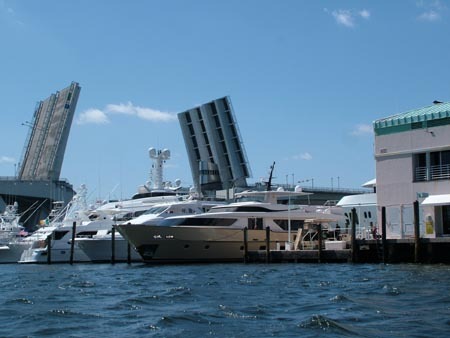 This bridge is 55 feet high and it opens for some of the mega yachts and the large sailboats. Pretty cool bridge. 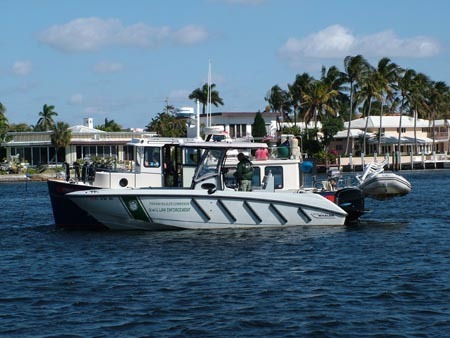 Then we turned left, headed out the inlet and wondered why so many security vessels were around. As it turned out there was a Navy Friget leaving and it left just after we did. I got a call from my brother a couple of days ago and he said "Video - I want Video." Truthfully, I was going to start doing a few videos when I got my new camera. It has 3 resolutions and the lowest is the one I would set it to so that you can download them quicker. 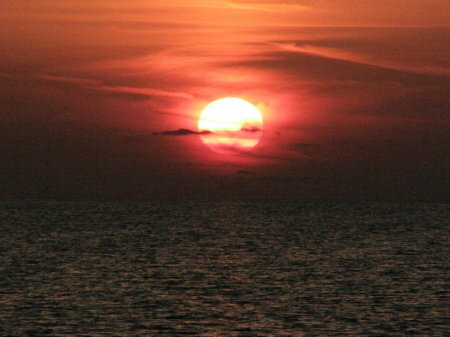 However, the day was just too wonderful so I took three of them on our trip from Ft. Lauderdale up to Lake Worth. These are my first and I just learned from my first posting how to compress them. So if you read this before and it said they were big files, they are smaller now. This is the best sailing video and I must tell you we were varying between 10 knots of wind and 24 with the boat speed varying between 4 knots and 8.6 knots at 50-60 degrees apparent. What a wonderful day!!!!! Did I mention this day was wonderful? We arrived at Lake Worth and anchored enjoying a great day at sea. 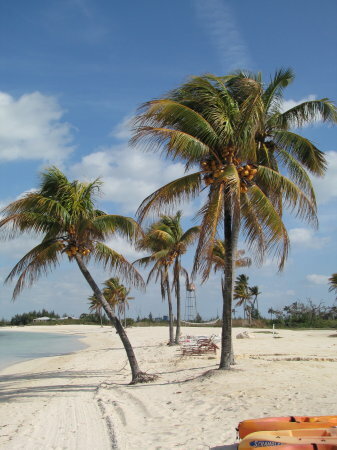 We will now hang out until the next weather window for the Bahamas. It appears that window won't happen for up to a week so we will get to know this area fairly well. Mar 17 - Sorry, no pictures. We walked around looking at stores, spending too much money in Bed Bath and Beyond then Fred and I headed off on a bus trip to a consignment shop for marine stuff. Ended up mostly just stuff we didn't need. Fred left this morning for his trip up the east coast trying to get to Elizabeth City in 3 weeks. We had a great time with him but it was time for him to head north and we are hoping for a weather window on Monday. We have conflicting weather reports but are hoping to get west winds on Monday so we can sail across to West End. Today we headed in and picked up the last of our three packages. One was a new camera - great news for you. New panoramic shots are in the future, along with HDR pictures. The second package contained an adapter cable for my broadband cards antenna which has improved our speed. That won't last long if we are heading to the Bahamas however but is great for the future usage. And the third package is some software that will allow me to do some things with our camera. Lots to learn and hopefully you will see the difference. 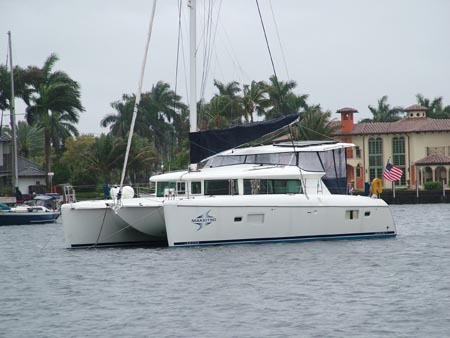 We are heading to Stuart FL tomorrow to arrive either tomorrow night or on Friday morning depending on when we get away. We are waiting for some wine to arrive at Publix and then we are off. All we need then for final provisioning is our fresh meat and some paper products. We will see what happens with the conflicting weather reports. Also, great news! We found there is a place to keep Jimmy Buffett in Stuart for even less money and we've been to there store 3 times before. We are planning on dropping him off on Friday as long as the weather window stays open. We will get some pictures tomorrow and maybe even a video as we head up the intercoastal waterway which is shorter than going outside from where we are anchored. Mar 19 - Yesterday we picked up some supplies from Publix before getting underway at 10 am then headed into the waterway to wait for bridges. Wind was on the nose so that was the only real option for traveling to Stuart. To the right you can see a picture of the dinghy dock along with the new marina. I'll get a better picture later. We then walked to downtown Stuart. Stuart calls itself the sailfish capital of the world so it is appropriate for them to have a large sculpture of a sailfish in a rotary. Then on to the downtown area which is a pretty nice place to just walk around looking in all of the shops. After dinner, we walked back and dinghy 'd back to the boat. Weather was still the same and Monday looked good as of last night. This morning I got up to the forecast you see to the right. Winds have changed a bit and strengthened for Monday. I was asked in an email what I look for to cross. In a nutshell, my watching for a window starts 5-6 days before and I use a program called Ugrib which downloads wind strength forecasts for up to 7 days in 3 hour increments. Then I compare this to Windfinder and finally look at the NOAA forecast. I am looking for the winds to shift to the east, then southeast, south, then west. I am hoping for a window that allows me to leave with the winds starting in the south or southwest and moving to the west as the day progresses. I also would like the seas to be less than 4 feet because the seas are on top of a swell which can be 3 feet. Then on top of that I really am looking for 15 knots or less sustained in the forecast because my experience is the winds are typically stronger than forecast. From what you read to the right, on Monday I have things going my way except for the wind strength which is now forecast to be as high as 25 knot gusts. We are planning on leaving at 4 am and would be at West End in the Bahamas at about 2 pm so this may or may not be a problem. I will just have to keep an eye on it over the next few days. Tuesday actually looks pretty good except for the part of it going north. As long as it would turn north in the afternoon then the north component wouldn't be a problem in the gulf stream. However, if it turns north earlier when we are in the stream that could be a problem because the north winds against a gulf stream make the waves stand pretty vertical which is a very unpleasant ride and one I won't do in my comparatively light boat. I guess we will just have to see. Regardless, we are going to finish up our preparations today and be ready just in case it all works out. Today: WNW wind 12 to 18 kt becoming N in the afternoon. Sunny. Seas 6 to 7 ft. .
Tonight: N wind 7 to 12 kt becoming E after midnight. Mostly clear. Seas around 5 ft. .
Saturday: ESE wind 6 to 8 kt. Sunny. Seas around 4 ft. .
Saturday Night: ESE wind 8 to 16 kt. A slight chance of showers after 11pm. Seas 3 to 4 ft. .
Sunday: SE wind 14 to 16 kt. A slight chance of showers. Seas 3 to 4 ft. .
Sunday Night: SSE wind 14 to 19 kt. A chance of showers. Seas 3 to 4 ft. .
Monday: S wind 16 to 19 kt becoming WNW in the afternoon. Winds could gust as high as 25 kt. A chance of showers. Seas 3 to 4 ft. .
Monday Night: W wind around 16 kt. A slight chance of showers. Seas around 3 ft. .
Tuesday: WNW wind 7 to 16 kt becoming N in the afternoon. Mostly sunny. Seas 3 to 4 ft.
Mar 20 - Quick update. We are very carefully watching the winds and you can see the front that is approaching. I pulled this image from the GRIB program I use to look at the winds up to 7 days out. We have plans for either going on Monday or waiting until later in the week. The good news is the winds from the forecast I showed you yesterday are down in strength on Monday and it looks like we will now have 15 knots out of the west. That means less than that in the morning and it should be a great sail. The other thing I wanted to note is that the direction of wind I'm looking for outlined above is for leaving from Lake Worth. If I was leaving from Ft Lauderdale or if I was leaving from down south heading for Bimini I would be looking to leave in a south wind. In other words, I should have said I want to leave with winds starting at 50 to 60 degrees apparent to the direction I will be sailing the boat and the forecast will be for the degrees to grow. The other thing is the direction I'm sailing the boat won't be the direction I'm going because I will have to steer 20 to 25 degrees to the south of the desired course to adjust for the gulf stream current. I'll update you before we leave and have some pictures from our visit today with some friends. 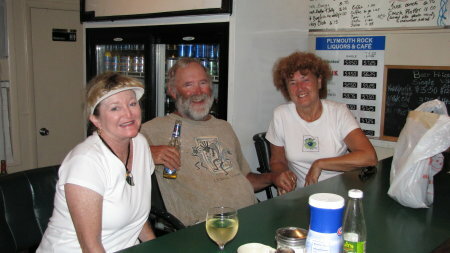 Mar 21 - We motored into 24 knot apparent winds today back to Lake Worth to leave tomorrow. However, after watching the winds become much greater today than forecast and seeing the forecast for tomorrow to also be higher than we thought, we decided to wait until Tuesday to cross. We are currently, 8 p.m, in a thunderstorm and I'm sure the gulf stream is pretty messy with winds that have been up to 26 knots. You will see to the left that those winds aren't in the forecast. 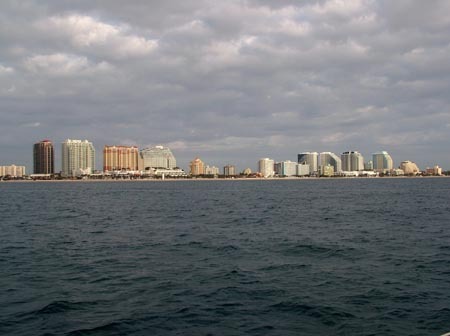 Now that the front is passing then I'm sure that things will start calming down and since the forecast is for Tuesday wonderful winds, I choose to leave on Tuesday morning at 4 a.m. and then cross and have a wonderful time offshore. Now for the technical problems. My new camera shoots video in quicktime which is a problem because I don't have software to convert it to WMV files. I'll get that solved tomorrow before we turn our phone and broadband card to vacation. So many days and just too much fun with technology. Tonight: S wind 15 to 19 kt becoming WSW after midnight. Winds could gust as high as 25 kt. Cloudy. Seas 4 to 5 ft. .
Monday: WNW wind 13 to 16 kt. Mostly cloudy. Seas around 3 ft. .
Monday Night: W wind 14 to 16 kt. Partly cloudy. Seas around 3 ft. .
Tuesday: W wind 9 to 15 kt becoming NNE in the afternoon. Sunny. Seas around 3 ft. .
Tuesday Night: NNE wind 5 to 9 kt becoming WNW after midnight. Mostly clear. Seas around 2 ft. .
Wednesday: NNW wind 5 to 9 kt becoming E in the afternoon. Sunny. Seas around 2 ft. .
Wednesday Night: E wind 7 to 9 kt. Mostly clear. Seas around 2 ft. .
Thursday: E wind 7 to 10 kt. Mostly sunny. Seas around 2 ft. .
Thursday Night: SE wind 10 to 12 kt. Partly cloudy. Seas around 2 ft. .
Mar 22 - Early morning update. It looks like we made the right decision yesterday evening. I won't give you the long version of the forecast except to let you know that the winds for today have been raised in their forecast from last night and Tuesday is still looking good. Today: W wind 14 to 19 kt, with gusts as high as 25 kt. Mostly cloudy. Seas around 3 ft. .
Tonight: W wind 14 to 17 kt. Partly cloudy. Seas around 3 ft. .
Tuesday: W wind 12 to 17 kt decreasing to 6 to 11 kt in the afternoon. Sunny. Seas around 3 ft. .
Tuesday Night: W wind 5 to 7 kt becoming variable and less than 5 kt. Mostly clear. 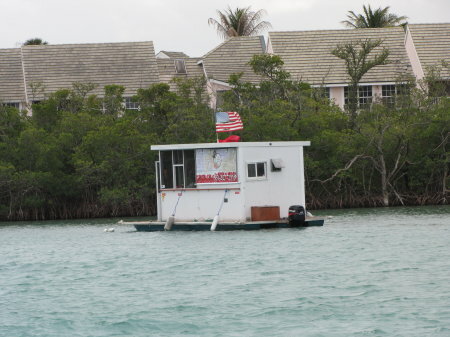 Seas around 3 ft. .
To the right is a picture of a "hot dog stand" that was floating in the Jupiter Inlet. I guess everyone is trying to make a living. 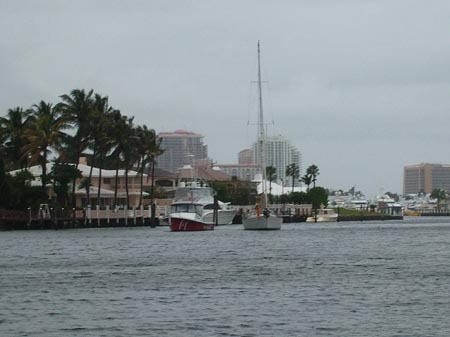 And then as we were approaching the PGA bridge in North Palm we saw again this boat which just happens to have a bit of a problem. 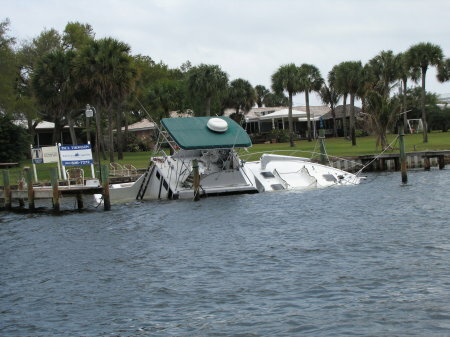 I'm thinking that if your house is for sale and you have a boat that has sunk out on your dock that the prospective buyers aren't as impressed as if it were floating. But then again, maybe that is just me. Yes, I did get my video converter and now we have the software so I can edit and compress the videos off of my new camera. I must thank Walt for the effort he made because he sent me some info on a freeware program just after I had downloaded a different piece of software. Thanks anyway Walt. We'll update again tonight after we reposition the boat to our positioning anchorage. (That means being in a great place to leave from tomorrow morning.) This anchorage will put us about a half mile south of the Lake Worth inlet. Mar 22 (again) - I've been getting used to my new camera along with the file structure and didn't get the picture to the right posted a couple of days ago. There are two very important parts of this picture. First, you might remember Paul, Pat, and of course Deb. We bought our boat from Pat and Paul. This is that one time in life when the buyer and seller remain friends. Afterall, a boat is a boat and the definition of a B.O.A.T. is bring on another thousand. Great friends and great people. The second thing you might notice is that with my new camera you have a wider field of view along with better colors. I'm happy. We had a great visit and Paul even took me to buy all the meat which is now frozen after a good day of my Engle getting it's act together. Ok, in my video I posted earlier I was wrong. The boat in the front wasn't Tiger's, it was the boat at the rear. 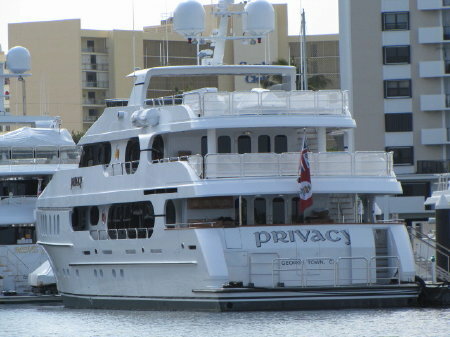 You can see the name of the boat to the left along with the aft door open which gives access to the crew's quarters. We left the Lake Worth anchorage and went down 1 mile below Peanut Island were we are ready to head out tomorrow morning at 4-4:30 a.m. I'm thinking I will pull the anchor and then motor sail until it gets daylight unless the winds are way down in the morning and then I'll pull up the main before we get underway. I guess we will just see. Just for fun I did another video of where we are. 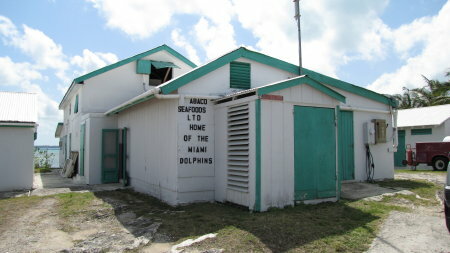 Who knows when we will get to post another video but I'm thinking that we are going to find a number of good wi-fi sites in the Abaco's. It rained all day and I'm happy that we didn't cross today. I'm really looking forward to a good clear day as a matter of fact a sailing day to cross. Now here is the link to the latest short video. Click Here. 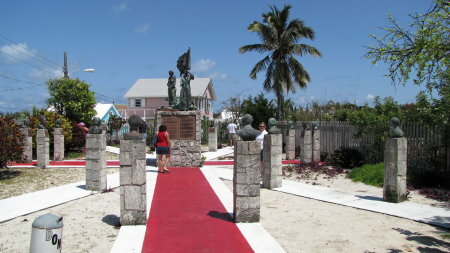 Mar 23 - We made it to West End on Grand Bahama Island. The crossing was sloppy which is a problem for me. I fed the fish with my breakfast. Otherwise, all it good. The water is beautiful, the beaches are great, and we are leaving in the morning for a 2-4 day trip to the next place we will be able to post. Winds are still up and we are heading against them for a couple of days which means we may just hole up a couple of days and wait after we get to an anchorage and out of West End. Take care and we will have pictures on the next update. As a minor addition to above, the winds were clocked as high as 30 knots on our crossing and on another boat just a bit north of us they saw 40 knots. That can build a sea. Mar 25 - Happy Birthday Deb! 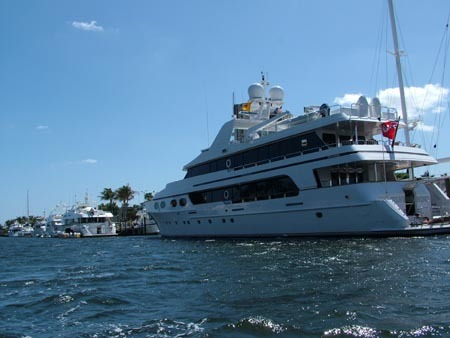 Yes, today is Deb's birthday and we are spending it anchored almost to the sea of Abaco. It is a beautiful anchorage but before I get to that, lets do the rest of the trip. 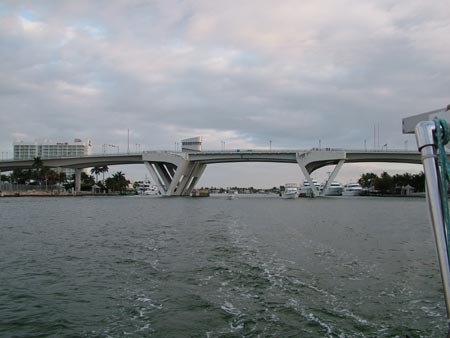 We left West Palm Beach which is the Lake Worth Inlet at 4 am. As we were leaving I thought it was going to be a great crossing except as soon as I ate breakfast, which was a tuna fish sandwich, I felt sick. That was before I even pulled the anchor. That should have told me something was up. As we crossed the winds built, seas built, and we were in 5-6 foot seas that I can only describe as a corkscrew. These are the ones that get me. Not the ones that we pound into or that we run from, it is the seas that pick up the port hull, then the starboard hull, the the starboard bow, and finish with the port bow only to do it again and again. These are the seas that cause me to feed the fish. Still, I am the guy in charge and it is not only my life and the boat, I have responsibility for Deb too. So, I know what to do. She takes the watches and if she sees something she tells me and I come to the helm to make decisions. You do what you have to do, period. We arrived in West End and it is a beautiful resort as you can see in the pictures to the right and below. However, before we got to this stage, I had to check in. If you would like to see a video on this beach, click here. Checking in is easy in West End. You call Old Bahama Bay as you approach and they will hand you the forms you need to fill out after you pull up to this dock which is also the fuel dock. You will see the entire perspective in a later picture. 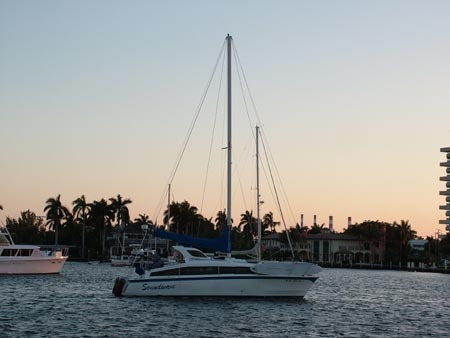 It takes about 20 minutes to fill everything out which includes crew lists, immigration forms, and forms about your boat along with what you are carrying and if you have arms on board or not. I'm sure they had a chef on board just to take care of them along with a larger crew to take care of the boat. Ah, money must be nice but I really like doing the chef thing myself. Welcome to my first stitched photo. This if for all the cruisers. The inlet to West End is small but deep. It is at the northern most part of the island and if this is your first time, get your binoculars out to make sure you are picking the right hole. Don't worry about taking your sails down outside, come in where it is calm and take them down in the turning basin. I didn't know about the basin and that was a mistake for me. However, it won't be in the past. You don't have to take a slip to check in and then get fuel. 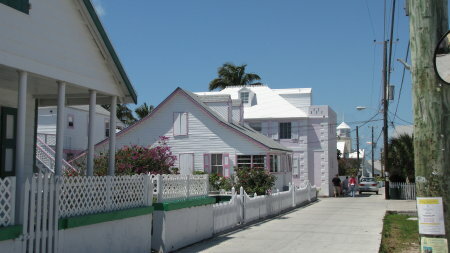 The pink building to the left is immigration and customs. The red building is the fuel dock which you've seen earlier and to the right is the turning basin along with the almost undistinguishable entrance. 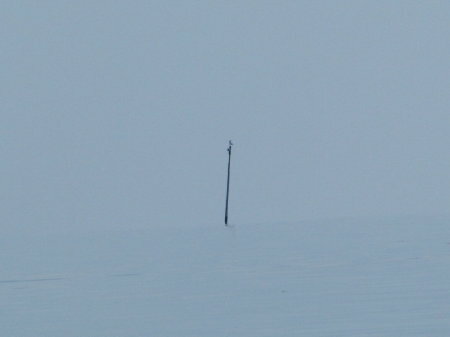 I just had to take this picture of the pole because it is a navigation aid. 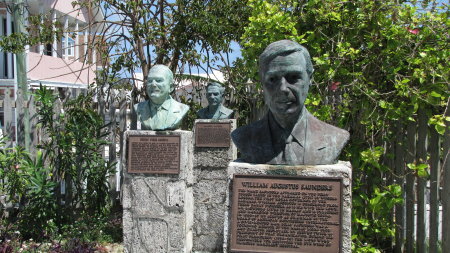 In the states we almost take for granted the navigation aids but when you get into the Bahamas or other countries you have to remember they don't have the resources that we have had in the past. Hopefully we will have at least some resources in the future to maintain our navigation aids and we don't end up with poles out in the water without a red or green marker on them. 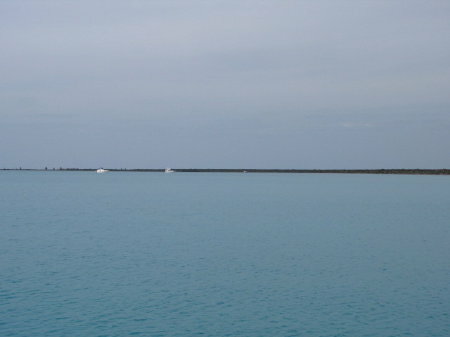 Below you can see where we anchored on our second night, Great Sale Cay (pronounced Key). 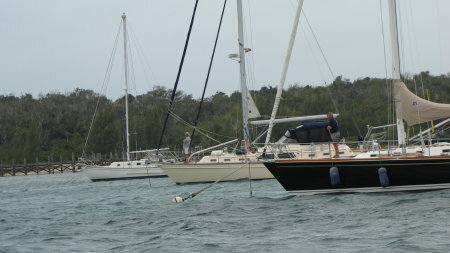 We ended up anchoring with about 8 other boats but 6 of them were heading back to the states or to Canada. It seems we are going the wrong way but what is new with that? Now I have two videos for you. As you can tell, I don't script the videos. As a matter of fact I just make them up and if I say the wrong things then so be it and I try to correct it. I'll try to get better. Click here for the second video with beautiful water. Garry, these sunsets are just for you. 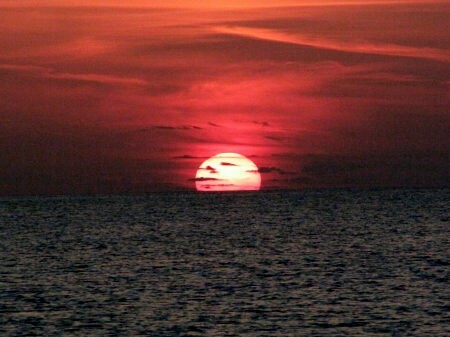 You see, Garry hates my sunset pictures because they just aren't the same as being here. I'll see what happens when I get on shore and am able to take the bracketed pictures for HDR photos. I'm still not sure if the HDR software I have works so we will just see. In all respect to Garry, I love sunsets and I'm going to work at making the pictures even better. 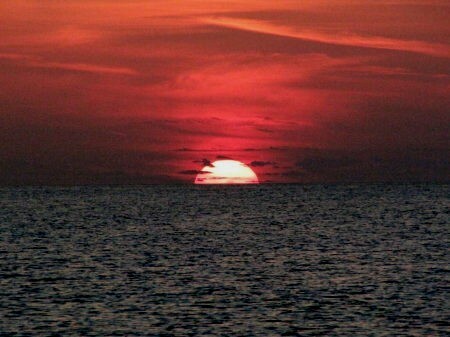 On the other hand, there is nothing like being on the back of your boat in foreign waters looking at a live sunset which is absolutely beautiful. It has so many shades and depth's of color that a camera just can't capture everything. I hope you are enjoying the trip with us. As we left this morning the wind was on our nose and it was 17 knots apparent. That meant slamming and 4.8-5 knot speeds because of the wind and waves. 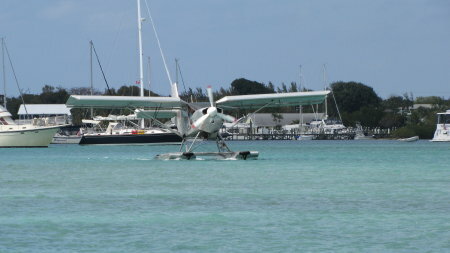 I guess we could have stayed but the winds are going to be perfect for heading down the sea of Abaco tomorrow. On top of that, we are really excited to be there so we pounded for about 4 hours and then I got off the beaten path and closer to shore to cut the waves down a bit. 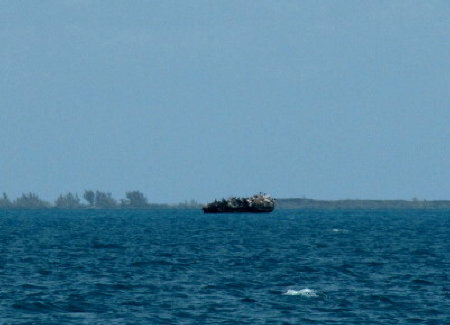 The day turned out good as we passed the "Center of the World Rock," which you see to the right, before we made our anchorage at Crab Cay. 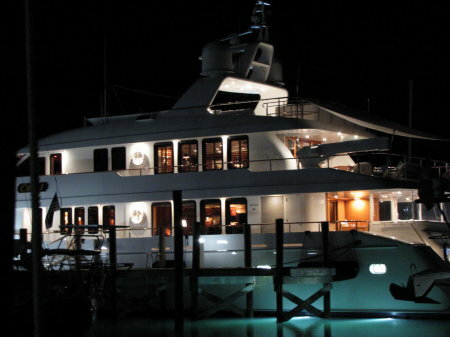 We are nicely nestled in our anchorage and just finished our birthday dinner for Deb. I cooked her a great Rib Eye slightly rarer than medium rare which is just the way she likes it. In addition, I made some mashed potato's from scratch and added cheese, butter, garlic, salt, and pepper which was just the way she wanted it. 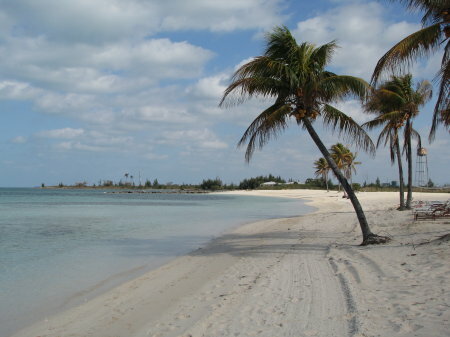 Other than that, what else could you want other than being in the Bahamas for your birthday. 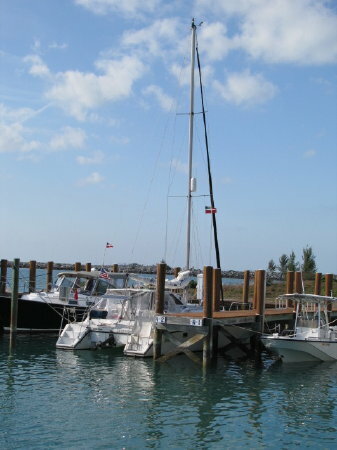 Tomorrow, we will see what the winds bring and I'm thinking we will sail to Green Turtle Cay. Yes, I mean sail. Hopefully video will follow. Mar 26 - This morning we heard a weather forecast from Nippers which called for the wind to clock from the south to southwest then by in the morning it was supposed to be out of the north to northeast. 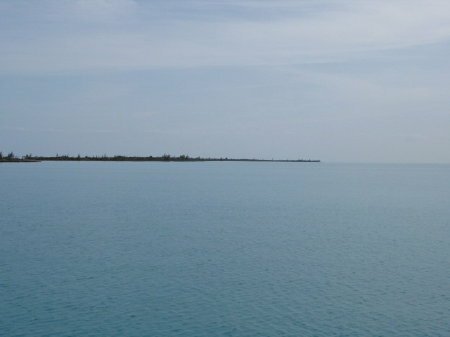 After it rained all morning, we pulled anchor at 12:30 and sailed then motored down to Green Turtle Cay (pronounced Key) which has a harbor protected all around. The place we were anchored before was totally exposed from the Northwest to the North so with 15 knot winds we would have had a roily and noisy night. I guess we will see if the weather forecast was right or not in the morning. 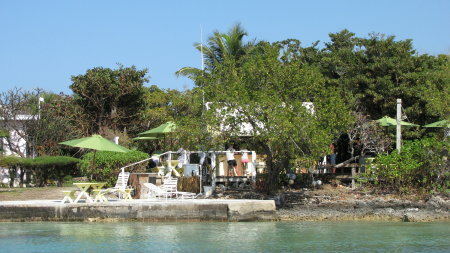 We have been looking forward to stopping at Green Turtle Cay because there are a number of things to do here. It is broken up between the north anchorage (white sound) and settlement creek or the town of New Plymouth. You can anchor in Black Sound but since White sound appeared to be the most protected we chose the latter. Tomorrow we put together the dinghy and we will probably be here for a couple of days to check things out and wait for the winds to move from out of the northeast. I'll tell you more about the "rage" around the Whale later although that is our next place to pass through. Our plans are to stop at most of the places we want to see on the way down and the ones we miss on the way back up. In reality, we have a short time of about a month over here so we have to make the best of each day. As you know, we haven't found a wi-fi spot yet but I'm sure we will in the near future. 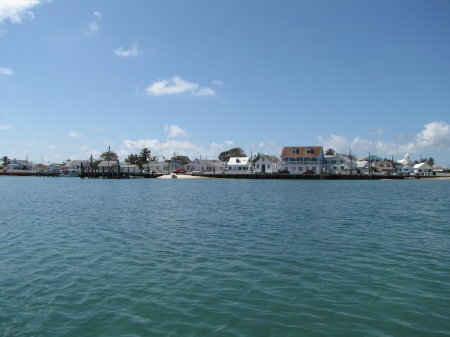 Mar 27 - We had a great day today, we've made it to the Abaco's and are now able to go ashore. I actually think we've found a place to upload the website too. I'll find that out tomorrow. 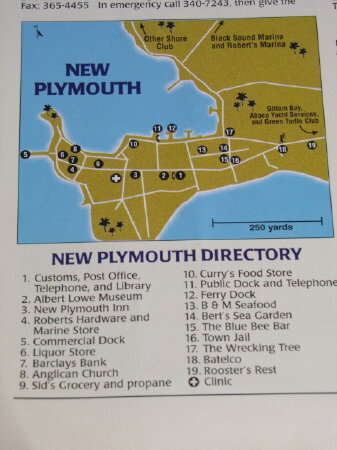 To the right you can see a map of New Plymouth and below a welcome sign that is above the government dock where we parked the dinghy. 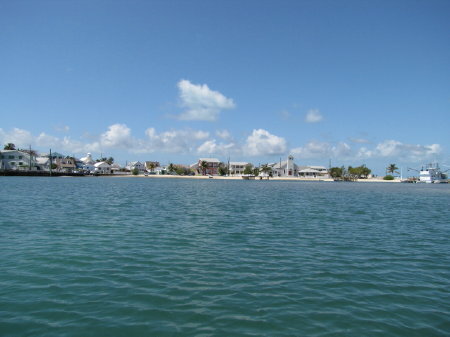 Below left and right is the view of the town from the water as we approached. 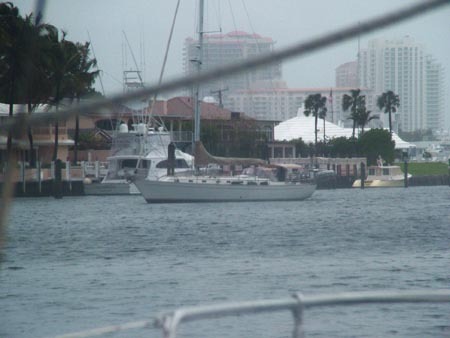 We are actually anchored in White Sound staying secure for the next front that will pass on Monday with 25+ knot winds. 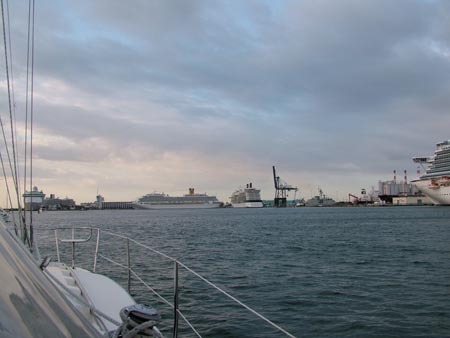 From where we are anchored, it is only a mile and a half dinghy ride into New Plymouth which is about the same distance as going to Key West from our anchorage. We went in and we were hungry. Following a recommendation from a cruiser, we were walking to a restaurant which was recommended when we had another cruising couple stop us and ask about our dinghy and then they told us about another great place to go to lunch and they would show us. Actually, they went to lunch with us. New friends. The place for lunch was a liquor store and cafe. 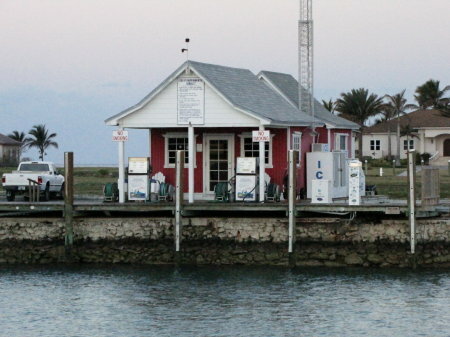 Ok, that may seem a bit different but bottom line is this is the BEST place to get a conch burger for a reasonable price in the Abaco's. $5.50 verses 12-15 elsewhere. We will be back. By the way, thanks to Rob and Bev. After lunch, we took a walk and headed for every store just to see what was in it. 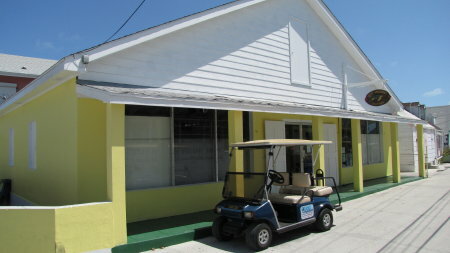 One of the first places we stopped was the grocery store below which was stocked much better than the stores in the Exumas and on top of that, the prices were pretty darn good. We brought too much food! From there, we headed on down the street watching out for the golf carts, cars and trucks coming down the one way street that looked almost like a sidewalk. 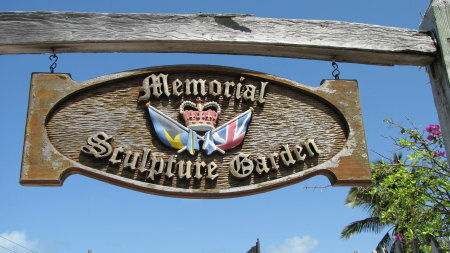 We found the Memorial Sculpture Garden and it was impressive. Lots of history here. 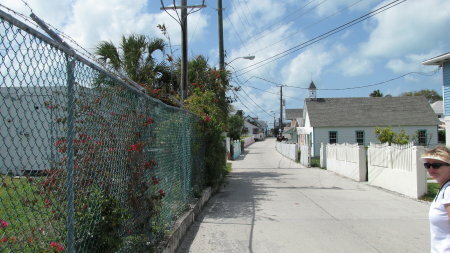 Then back down another "street" heading for the fish market where we had heard there was a pretty good deal on lobster. The reality is it was a good deal. We picked up two lobster tails for 11 bucks - a meal in a couple of days when the next front comes through. You can see below the "storefront." We walked in the open door, opened the next door to a room with some scales and said "Hello" in that manner of a person wondering if they were supposed to be there of not. Then out came a guy who sold us the two lobster tails, he was in the back room with the drum set. 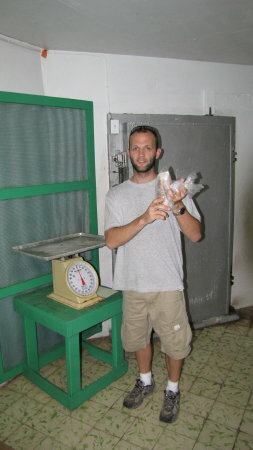 They also had fresh grouper and other fish too but our freezer is full and we know where the place is now. We then headed back to the dinghy, again down what could almost pass for a sidewalk but was that street I've already told you about. 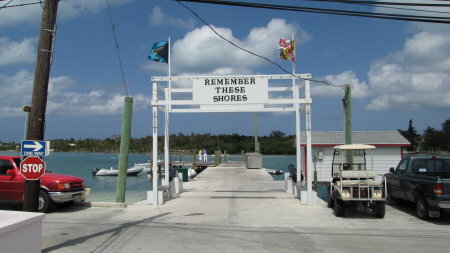 Then back to the dock with the cool sign that said to "Remember these shores." At least they know some marketing here. 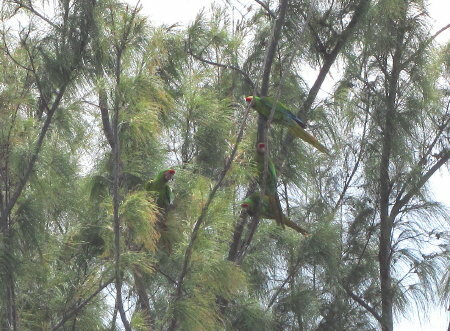 On the way back we saw the parrots that another cruiser told us that were living along the shore. It just happened that we got a couple of pictures and thank you new camera. 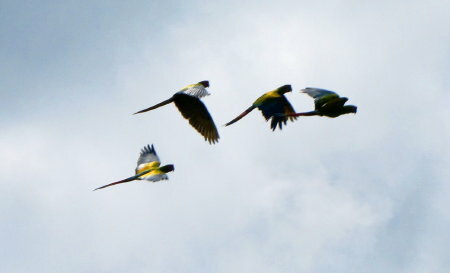 To the lower left you can see the four of them in a tree up about 50 feet off of the ground and then to the lower right they took flight and we just happened to catch them in flight. The next thing that happened is a float plane came out on his way home I suppose. It certainly appeared this was a homebuilt. Pretty cool and they just came in for lunch. We also had been invited to Pineapples for happy hour. You can see it below and it was a dinghy ride back over again. Below right you can meet Ron, Bev, Deb (you should know her by now), Rene, and Stacy. All cruisers enjoying life. Are you sure you don't want to join us? Mar 29 - Why are these guys standing on the front of their boats? Ah, a question that probably should linger but you know I will tell you. The guy with the black hull is ready to put out finders because this is the second time the guy in the cream colored Island Packet had drug. (Just to jump ahead, he will reset his anchor another two times before it gets dark.) The I.P. isn't alone, no he is in pretty good company although I'm not in the dragging crew. We have about 20 boats anchored and all told 7 of them drug today. The story gets pretty good but first, let me catch you up with a video. Yes, I did another one today in the midst of the front. I digress but I forgot to take some pictures of the happy hour on our boat yesterday which actually is a good thing because I'm now on island time. It was just another happy hour and you will be much happier with the video today. Action video - click here. So here we are after taking the video and I was just thinking that I need to download that video and update the website just for you. 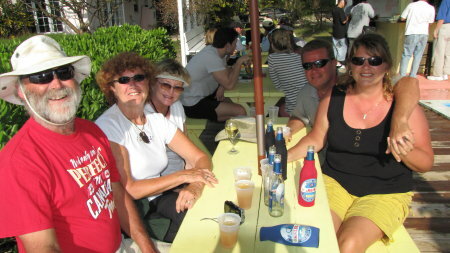 Then Deb said, "Jim, River Rats are dragging behind our boat." Let me catch you back up. River Rats is the name of one of the boats that got drug into earlier by another boat and then they drug. They moved their boat onto a "secure" mooring. But I MUST digress again, moorings in the Bahamas are not secure!!!! They came up and picked up that mooring in front of us and to our port. No problems mon. I started thinking about the upcoming wind shift and I took an anchor out to the north west where the wind was supposed to shift tonight because a rental boat had come in and picked up a mooring just off our port and we might be close to it when we swung. I decided to stop that and just put out the second anchor. With us secure, I was happy. Now back to the fact that River Rat was behind us dragging their mooring with them. I asked Deb to get my rain suit top and I was in the dinghy getting it started. I first helped them get the mooring lines loose from my dinghy although we had to leave the lines with the mooring ball because he almost ran over and sank my dinghy while I was trying to hold on to the lines. (He was trying to avoid hitting that rental boat.) I decided that dropping the lines was better than swimming - pretty smart right. I then ran the dinghy around their stern to ask if they would like me to help them on their boat or stay in my dinghy, she asked the Captain and I was immediately invited aboard a moving boat. With my dinghy painter (line) secure, the lady ran forward but I was dragging along behind. I turned off my dinghy and pulled the line forward so I could get on the 45 foot Hunter, which by the way sails at anchor like a wild boat. I boarded the boat and asked the Captain where he wanted my help and he told me where the boat hook was and asked that I go forward to help his wife pick up another ball. I did so and noticed the ball was a "private mooring." Well nobody was there and my bet is nobody is coming. The mooring is probably better than the ones being rented out but still in question but that is later. The lady had the new lines secure to the boat in a very quick fashion and I picked up the mooring line and ran one of her lines through and she secured the end. We were on the ball. Then another dinghy came up and I handed him down a second line and we had boat secure. Next I asked the Captain if he would like me to run his anchor out as added protection since the wind was going to shift. 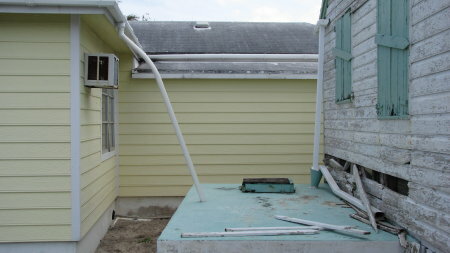 I suggested the house with the green roof but left the decision to him since it was his boat. He agreed and dropped the 45 pound Delta into my dinghy and I pulled out as much chain as I could drag with my little 8 hp port-a-boat and dropped the anchor. All in all, a good day. I came back to our boat and we were fine except that rental boat had drug on their mooring too. 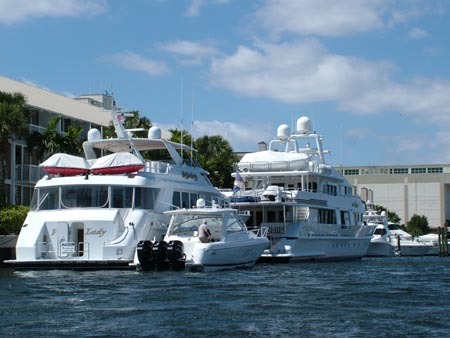 I went over and told them that if it were me, I wouldn't stay 6 feet from a boat on a dragging mooring that was worth about a million and I would go to a marina since there aren't any balls left. By the way, they had already told me their anchors weren't of any size. They agreed and with some more coaching, they got off their ball and headed in for a good night sleep and probably a few drinks too but the bottom line is they had a great story for their vacation. We are still hanging solid and that gets us to anchoring. I'm VERY happy with my Rocna and I also have a bunch of other anchors on board. What I noticed today is that most of these boats have too small of anchors on board even though they have lots of chain. I guess they will learn or not. All in all, the little port-a-boat guy was in the thick of it having a great time in the Bahamas. Don't you just love excitement. 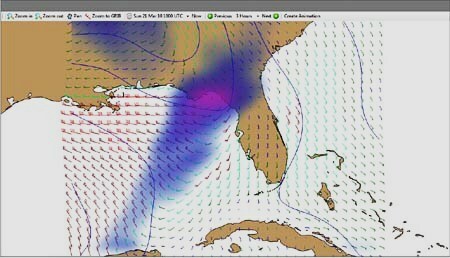 Tomorrow we will let the winds die down and then we are on the move on Wednesday heading on down the Abaco's. We are having fun but we've been here too long. You can't have a schedule etched in stone. In the cruising life, one of the best sayings I've heard is that "we have our plans written in the sand on a rising tide." Everyone has to be flexible and we just happen to have Wi-Fi here so that means we've been able to watch this front come through along with making some calls with Skype. Hope you are enjoying the trip. Mar 31 - I'm updating this morning because I don't know when I will have internet service again. 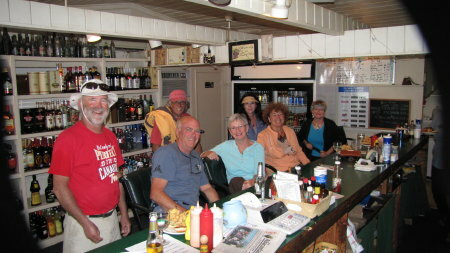 We met a bunch of cruisers at Green Turtle Cay and it has been fun running into them all over the island. 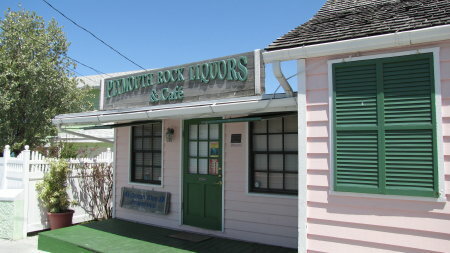 Again, we ended up all meeting up at the little liquor store/cafe for the best Conch Burgers at the absolute best prices in the Abaco's. Following great conversation, lunch and a bit more shopping, we were back to the boats. Below you can see one of the transport ships delivering goods to the island. 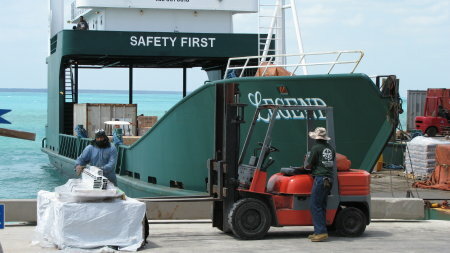 As you can imagine there aren't bridges connecting everyone so the ships are essentially the 18 wheelers for delivery. This is the main reason everything is a bit more expensive here verses the states. Walking back I just had to take this picture of the cistern along with the roof drains which provide drinking water for the homes and for the businesses. I'm sure they filter it and also probably put a bit of chlorine in too. We went back to the boat and headed over to the Bluff House Marina just so Deb could take a shower in a "real shower." Me, well I'm pretty happy on the boat and it just isn't worth the 5 bucks to me although if I had long hair like Deb it just might be. I took the picture below from the Bluff House Marina and it shows the anchorage along with their marina. We were then invited over to another boat and they heard I played guitar. So, we had fun at happy hour and for the first time in six months I was playing and singing. The good news is twofold. First nobody jumped overboard. Second, my thumb appears to be almost done healing after I pulled or tore a tendon. The guirar will come out again. 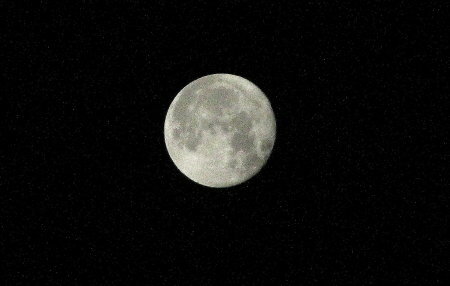 What a beautiful full moon! I was awake at 6:30 and the moon was wonderful so I started playing with the camera on the long zoom until I got a pretty good exposure. I still have lots to learn about the camera but many of you are giving me reports that you really think the pictures are better. Thanks for the feedback. 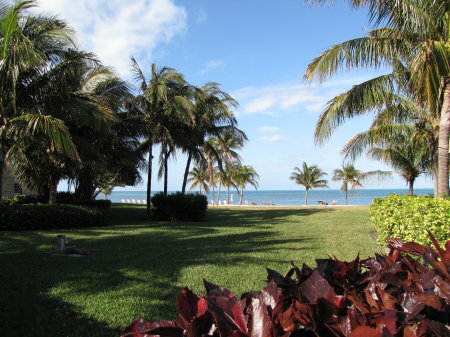 We are leaving in about 2 hours for Treasure Cay which is supposed to have one of the most beautiful beaches in the world. I just have to see that and of course you will as well. We will update next time we have a good connection. See you later and again, thanks for checking out the site. One last thing, the weather here is wonderful and it is supposed to remain that way for the next 5 or so days. It is great to be cruising again!